What Words Are Engraved on the Liberty Bell? If you are an American history fanatic, you may be wondering what words are engraved on the Liberty Bell. In order to understand why these words were engraved on the Liberty Bell, you may first need to understand the history surrounding the Liberty Bell. There are two main components of inscription on the Liberty Bell. The first is a Bible verse taken from the book of Leviticus 25:10 and it reads, "Proclaim liberty throughout all the land unto all inhabitants thereof." This first inscription was appropriately engraved into the Liberty Bell because in the biblical verse directing preceding verse 10, the Bible references "the fiftieth year." Coincidence? Probably not. The second inscription that is on the Liberty Bell are the words "By order of the Assembly of the Province of Pensylvania for the State House in Philada." Yes this is the exact spelling that is used on the Liberty Bell and no it is not a typo. It has been said that in the Constitution the state of Pennsylvania the state's name was spelled like so "Pensylvania." The final inscription are three words centered on the front of the bell, and they are "Pass and Stow/MDCCLIII." 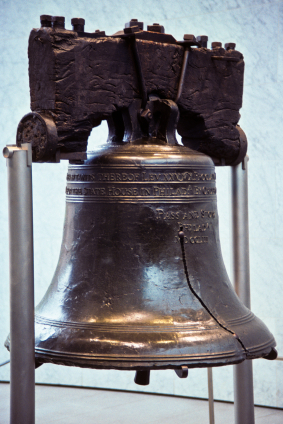 On July 8, 1776 there was a "chime that changed the world" that rang from the bell tower of Independence Hall in Philadelphia, PA. That chime was to invite the people of Philadelphia to hear the reading of the Declaration of Independence. The chiming bell marked the first public reading of the document which was read by Colonel John Nixon. The Liberty Bell came into existence in 1751 as a commemorative token for the 50th anniversary of Pennsylvania's original constitution which addresses the rights and freedoms of people on a global scale. Due to this, the Liberty Bell gained critical acclaim during the Abolitionist movement that led to the end of slavery. "What Words Are Engraved on the Liberty Bell?." YourDictionary, n.d. Web. 20 April 2019. <https://quotes.yourdictionary.com/articles/what-words-are-engraved-on-the-liberty-bell.html>.